The second in Urban.com.au's series taking a closer look at each one of Nightingale Village's ensemble of seven buildings, is the Hayball designed CRT+YRD. As the moniker - chosen within Hayball via a naming competition - suggests, the design provides the building with an identity that is readily and easily understood, according to the architects. To reinforce the importance of this feature, CRT+YRD has been designed from the inside out, with the courtyard centrally located, forming the heart of the building and becoming the symbol of the project. This provides not only a unique response to the building's interior environment via open walkways on the upper levels but also improved resident amenity through solar access, and passive ventilation and surveillance. Further, Hayball have designed the the communal space and the building as a whole to foster a sense of community which provides a platform for social interaction and engagement. CRT+YRD's material palette draws on the surrounding light industrial context by way of the use of off-form concrete, breeze block and brickwork to reinforce the street wall condition. 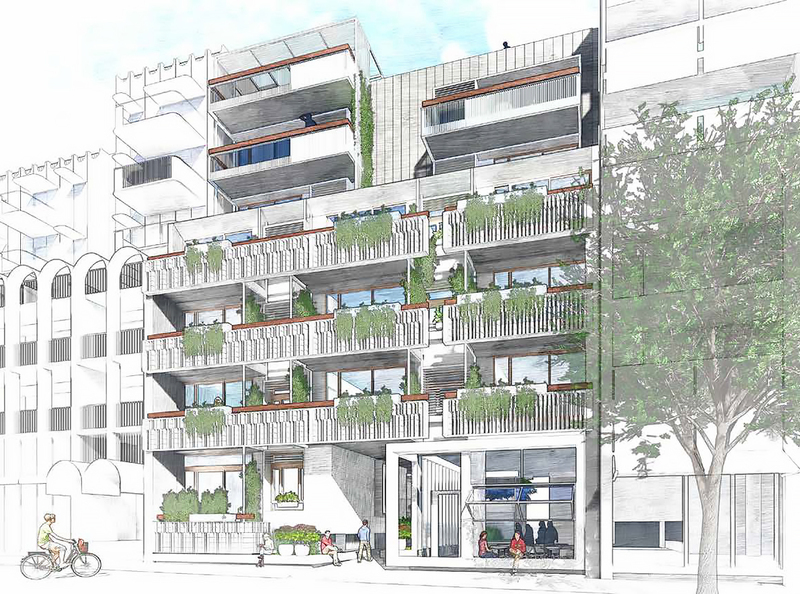 The upper levels are characterised by a much simpler palette of galvanised steel cladding, frames and grated sun shades providing a point of distinction between the street wall, while also mediating the strong rectilinear forms of the neighbouring Nightingale Village buildings. The proposal is a coherent extension of the principles established in the Nightingale Village master plan. The central light court provides the formal mechanism to achieve this heightened sense of community, promoting excellent visual connection, light and ventilation between apartments. This well established model has a number of local precedents, including the Beverly Hills apartments in South Yarra designed and constructed by the architect and developer Howard Lawson between 1935 and 1936. All apartment living areas have primary aspect to either Duckett St or the Mews. The majority of apartments feature at least 1 bedroom also addressing these orientations. Open walkways at each level expand at apartment entries and the lift creating gossip areas. By beginning with the courtyard and designing with the resident experience at the forefront, Hayball have ensured that CRT+YRD's residents are able to connect and retreat throughout the day based on personal preference. 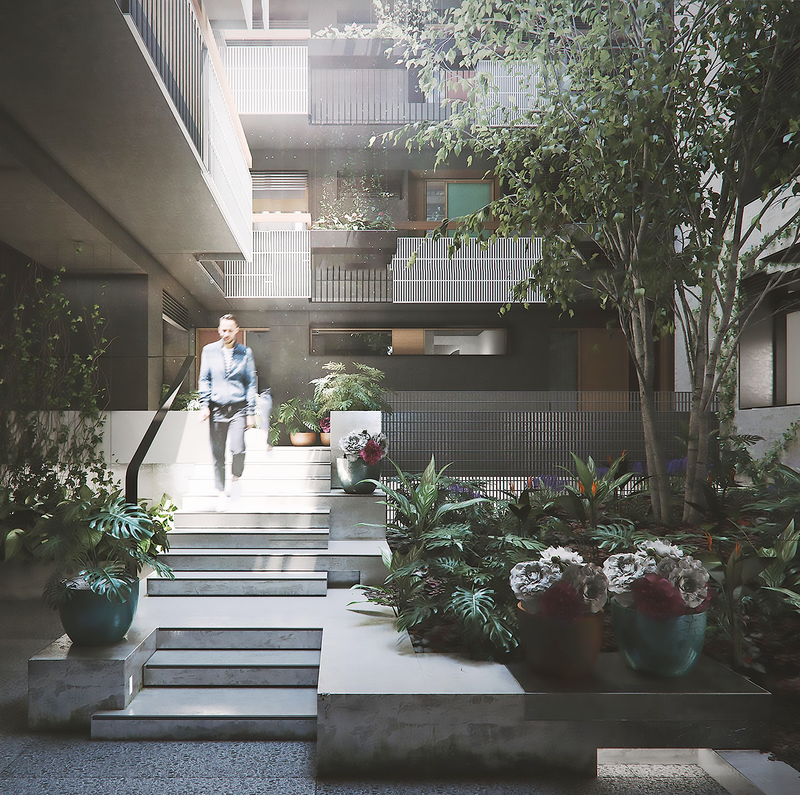 Landscaping, plants and shared garden spaces dispersed throughout the soften the austere exterior of the building, while also contributing to a healthy and vibrant community. Planter boxes distributed throughout courtyard walkways, apartment private open space, and communal areas allow for further personalisation of their building. Rather than designing for any particular lifestyle or demographic, Hayball has designed the apartments to provide residents with the flexibility to tailor their residences to suit their respective lifestyles. Bay sills as mediating zones for personalisation of the common walkway with plants and alike, or informal seating areas supporting interaction. Additionally, the majority of apartments enable the building to accommodate residents of varying age and physical mobility. Next up in the Nightingale Village series will be Clare Cousins Architects' Nightingale CCA. Editor's note: You can also listen to Urban.com.au's interview with Hayball's Bianca Hung on our weekly podcast, where we discuss the design process in greater detail.